LaTeX Lab is a web-based LaTeX, using Google Docs as its platform so you’ll need a Google login to try it out. 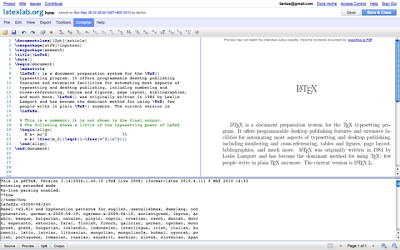 Since “sharing” a document is a default feature in Google Docs, LaTeX Lab can be used as an online collaborative editor. Once saved, your LaTeX file will show up in your Google Docs file list, but you must access open it again via the LaTeX Lab link to get the LaTeX editor GUI. Opening the file from Google Docs will just show it as a plain text file, without the LaTeX syntax highlighting and toolbars etc. However it’s still a preview release, so you probably don’t want to depend on it for your day-to-day use just yet!